Your email address and password are required to login. Please try again. Stay logged in. Requires cookies. What is a My Lilypie account? With a My Lilypie account you can sign in and see a list of the tickers you have associated with the account. Creating a My Lilypie account is quick, easy, and free, just enter your email address and a password. We will then send an activation link to your email address, click on the link and your My Lilypie is ready to go. From the My Lilypie page you can display the options for each ticker by either hovering over the ticker (on a desktop computer), or tapping on the ticker (on a mobile or touch enabled device). From the ticker options box, you can share the ticker, get the ticker code, edit or update one or your tickers, or remove the ticker from your list of tickers. Please note, removing a ticker, wont remove it from all the places you have been using the ticker eg, your email signature, forum signature etc, you do that through that application. For instance, to remove a ticker from your Hotmail signature, you would log in to Hotmail. There are instructions for other applications under their respective headings in the Help section.. , or edit account details such as your email address or password. 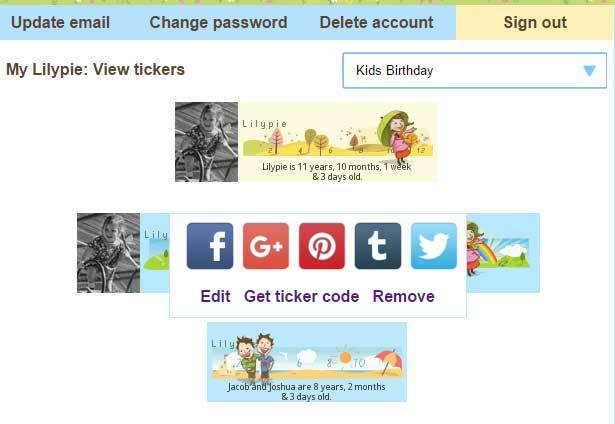 In the My Lilypie section you can also edit account details such as your email address or password.